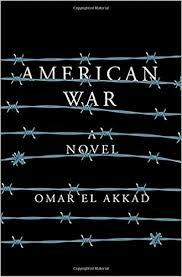 Author Omar El Akkad imagines in his first novel how the ravages of the Second American Civil War separate a late 21st Century America and divide its people. From a premise, and with that war as an intriguing backdrop, American War moves beyond the dystopian stories that are all the rage and presents a believable time, where climate change has altered the map, and made proud Southerners refugees in their own nation. El Akkad has a beautiful writing style and digs deep into presenting the future as history. Unfortunately the narrative doesn’t hold up as strong, becoming an exile within its own prophetic stance. American War tells the tale of Sarat Chestnut, who becomes a revolutionary for her people, although the majority of her “people” never ask her to step up, don’t exactly understand the need of a hero, nor, aside from other self-entitled revolutionaries who seek to propagate the war for the sake of simply fighting, are they in the mood to enshrine one. Which brings forth the question: what is the investment for the reader? El Akkad is extremely obtuse in supplying an answer. El Akkad, born in Egypt, and raised in Qatar, definitely possesses a unique view of Americans and the whole mom-and-apple-pie way of life. His time as a journalist helps extend his unique, and believable, setting, complete with all its ideologies and theologies but cementing in the proof that violence begets violence and brother, that’s all Sarat is. And that is her downfall as a character. She is not provided with the chance to be cherished. She becomes a tool of an obtuse agency and is set on her way going through a series of challenges and torture that has been seen before, and handled better. The tale of Sarat is bookended by the narration of her nephew, who obviously loves his aunt and understands her cause. She is the one he worships when all others have turned away. He presents her life as one being worthy, one with reason. And that is the story this book should have been.